Greninja is a Water/Dark-type Pokémon from the Pokémon series that evolves from a Frogadier at level 36. It is the final form of Froakie. It is a newcomer playable fighter in Super Smash Bros. for Nintendo 3DS and Super Smash Bros. for Wii U. It originates from Pokémon X and Pokémon Y. Reflecting on its naturally high speed in these games, Greninja's attacks and movements in Super Smash Bros. for Nintendo 3DS / Wii U are agile. Greninja appears from a Poké Ball thrown onto the stage. Greninja is features as a playable character in both Super Smash Bros. for Nintendo 3DS and Super Smash Bros. for Wii U. 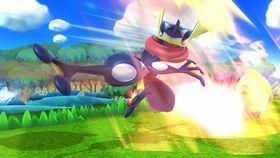 During development, Masahiro Sakurai had already determined that a new Pokémon would be included as a playable character, and chose Greninja based on concept drawings, before Pokémon X and Y were released. 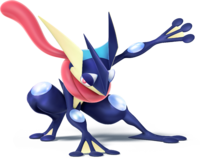 Most of Greninja's attacks involve jabs, kicks, and close-range water attacks. Its special moves are all based upon moves in the Pokémon series that it can learn. Its standard special move is Water Shuriken, one of its signature moves. Its side special is Shadow Sneak, its up special is Hydro Pump, and its down special is Substitute. Greninja's Final Smash is Secret Ninja Attack. 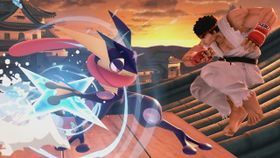 Greninja reappears as an unlockable playable character in Super Smash Bros. Ultimate. Greninja's Final Smash remains as Secret Ninja Attack, but it transforms into Ash-Greninja before using the move. Additionally, attacks involving Greninja's water katanas are now replaced by water kunai. Water Shuriken is Greninja's standard special move, originally appearing as one of Greninja's signature moves (prior to Pokémon Omega Ruby and Alpha Sapphire) that it can learn at levels 36 and 75. Greninja throws a shuriken of water directly ahead. By holding down the button before releasing the Shuriken can be charged, making it larger and more powerful; at its most powerful, the shuriken can push opponents and deal multiple hits. In Super Smash Bros. for Nintendo 3DS and Super Smash Bros. for Wii U, the first custom variation of this move is Stagnant Shuriken (known as Still Water Shuriken in PAL regions), in which Greninja throws a shuriken that stays in place to damage foes for multiple hits. The second variation is Shifting Shuriken, which has Greninja throw one of two types of Water Shuriken depending on whether the button is tapped or held. When the button is tapped, a smaller shuriken that travels a short distance and deals greater knockback is thrown; when the button is held, a larger one that travels farther and through opponents is thrown, though it has less knockback. Shadow Sneak is a Ghost-type move appearing as Greninja's side special move. In the Pokémon games, Greninja can learn Shadow Sneak at level 23. By holding down the special move button, a shadow is projected that moves forward in the direction it is facing. The shadow always moves a set distance, and Greninja can also move forward or backward slowly when projecting the shadow. After a while Greninja automatically warps to where the shadow is and attacks with a kick; this can also be done by releasing the special attack button. The shadow cannot move on slopes if Greninja is on flat ground. In Super Smash Bros. for Nintendo 3DS and Super Smash Bros. for Wii U, the two variations of this move are Shadow Strike and Shadow Dash. When using Shadow Strike, the move takes longer to perform, but the shadow can move farther across the ground and the attack is more powerful. When using Shadow Dash, Greninja automatically warps a set distance and attacks; this is faster, but less powerful. Hydro Pump is a powerful, recurring Water-type move in the Pokémon series appearing as Greninja's up special move. When used, Greninja launches itself up into the air with two blasts of water from its palms. The player can launch Greninja in any direction with each blast by angling the control stick or Circle Pad in the appropriate direction. The move can also damage opponents and push them away. In Super Smash Bros. for Nintendo 3DS and Super Smash Bros. for Wii U, the first custom variant for this move is High-Capacity Pump, which enables Greninja to fire water pumps that are easier to control, and offer greater distance overall than Hydro Pump, but the move travels slower than normal, and is not able to deal any damage. The second custom variant is Single-Shot Pump, where Greninja launches itself straight up with a single water pump, which covers more vertical distance than Hydro Pump. The move's angle can't be changed, however. Hydro Pump is also used by other Pokémon in the Super Smash Bros. series. In Super Smash Bros. and Super Smash Bros. Melee, Hydro Pump is the move used by Blastoise when it is summoned from a Poké Ball. In Super Smash Bros. Brawl and Super Smash Bros. 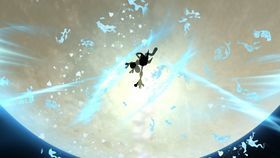 Ultimate, Squirtle uses Hydro Pump in the Pokémon Trainer's Final Smash, Triple Finish. Substitute is a Normal-type move recurring throughout the entire Pokémon series appearing as Greninja's down special move. When used, Greninja braces itself and when attacked disappears, replacing itself with a substitute while counterattacking the opponent. The direction the attack comes from can be influenced by holding a direction on the control stick. The substitute that appears can either be a log or the doll that appears when the move is used in the main Pokémon games. Afterwards, the substitute remains on the field for a while and can be attacked to knock it around and damage other players. 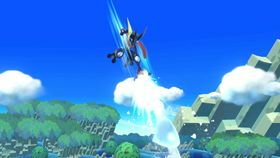 In Super Smash Bros. for Nintendo 3DS and Super Smash Bros. for Wii U, the first custom variant for this move is Exploding Attack; while it cannot be used as a counter, Greninja instead automatically disappears and reappears in an explosion. The second is Substitute Ambush, which has Greninja counterattack with a slower but more powerful attack. Secret Ninja Attack is Greninja's Final Smash. After grabbing a Smash Ball and activating the attack, Greninja uses Mat Block, one of its signature moves. The move involves summoning a tatami on the floor in front of Greninja which he flips up, sending any opponents on it upward. The move then transitions to a cinematic with the trapped opponents in front of a large moon and Greninja using what appears to be Double Team to launch repeated attacks. After the attacks, Greninja launches the opponents downward, causing them to rebound upward off the ground. If their damage is high enough, the opponents are sent past the upper blast line and KO'd. In Super Smash Bros. Ultimate, Greninja turns into Ash-Greninja for the Final Smash. By tapping the Greninja amiibo to the Wii U GamePad in Super Mario Maker, the player unlocks a Mystery Mushroom that gives Mario a costume based on Greninja. The costume can also be unlocked randomly after completing the 100 Mario Challenge on Expert or higher. (3DS) 3DS Pokémon X and Y (10/2013) This Water/Dark-type Pokémon is the fully evolved form of Froakie. It's just as fast and dangerous as any other ninja, and the throwing stars it can make out of water can shear metal. 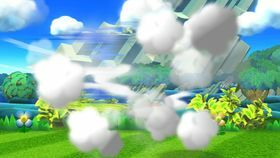 In Smash Bros., as well as being a graceful, speedy fighter, it can also use moves like Hydro Pump that let it travel through the air and avoid falling. 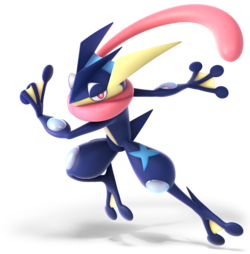 (3DS) N/A Greninja's Substitute down special lets you teleport to dodge attacks and then strike back, making it an effective and hard-to-predict way to counterattack. You can also control where you reappear by inputting directions. When you vanish, sometimes you'll be replaced by a log, other times a cuddly toy. Red indicates exclusive to the Nintendo 3DS version. Blue indicates exclusive to the Wii U version. Pit: What?! But that just makes no sense! ...Anyway, just tell me how to win! Palutena: Greninja creates throwing stars out of compressed water and unleashes them at high speed. This attack is called Water Shuriken. If Greninja starts to charge its Water Shuriken, be prepared to reflect it back! This Water- and Dark-type Pokémon is the fully evolved form of Froakie. It’s just as fast and dangerous as any other ninja, and the throwing stars it can make out of water can shear metal. When it spins the stars and throws them at high speed, they can split metal in two. Gekkōga From "gekoh" (げこっ, a frog's croaking) and Kōga-ryū (甲賀流, translated as "School of Kōga", an ancient ninjutsu school); officially romanized as Gekkouga. French Amphinobi From "amphibie" ("amphibious") and "shinobi". German Quajutsu From "quak" ("croak") and "jutsu" (術, Japanese for a special skill to fight). Gaegulninja From "gae'gul-gae'gul" (개굴개굴, sound of croaking in Korean) and "ninja". Jiǎhèrěnwā Comes from the Japanese name. Literally means "Kōga's Ninja Frog". This page was last edited on February 24, 2019, at 17:23.